The guide begins with the description of Le Sette Chiese (the most important churches) and then covers those on the right bank of the river. For the visit to the enormous amount of churches on the left bank, Francino developed some broad itineraries. The first one started from Porta del Popolo, it followed Via del Corso (with detours in the nearby streets) and it ended at the foot of Campidoglio. This approach influenced the writers of guides for many centuries. Giuseppe Vasi's 1761 guide began with a Day one itinerary which was based on that of Francino. XIXth century foreign guides started their description of the City of Rome from Porta del Popolo. In the XVIth century and until the end of the Papal State in 1870, books could not be printed without the imprimatur (let it be printed) of the Sant'Uffizio (or Santa Inquisizione). Francino's guide reports in the first pages the licence which was granted in 1587: it is a lengthy document written in Latin which shows that the guide was scrupulously checked to ensure its consistency with the doctrine and the wishes of the Roman Church. This maybe explains why the description of the ancient monuments was placed at the end of the book and it was not supported by illustrations. It may also give a clue to the choice of the illustrations for the churches. Pope Sixtus V, the reigning pontiff, in 1588 improved the access to SS. Trinità dei Monti and his predecessor, Pope Gregory XIII, built S. Atanasio dei Greci. By highlighting the achievements of the most recent popes, Francino increased the chances of obtaining the imprimatur. 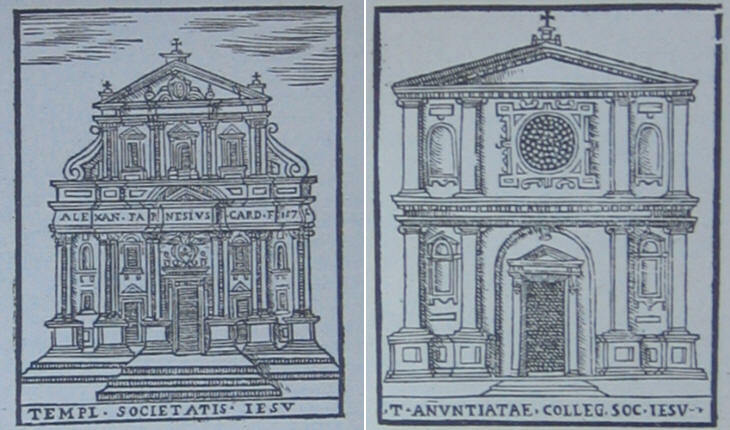 In 1588 the hospital of S. Giacomo in Augusta (or degli Incurabili) was in the process of being renovated: Cardinal Antonio Maria Salviati financed the project which included a new church which replaced a medieval one. 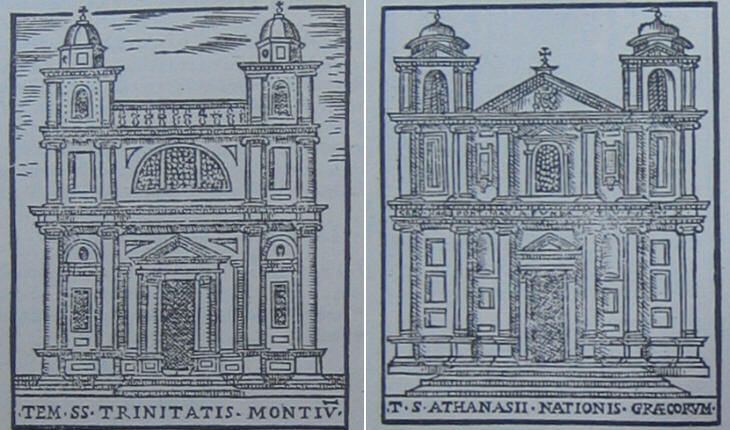 The church however was yet to be completed so Francino illustrated the small 1584 rear façade of the hospital. He paid careful attention to make the inscription readable because it mentioned the very powerful cardinal (in the text he wrote that the cardinal spent 25,000 scudi). The illustration of S. Lorenzo in Lucina was helpful in the 1920s when the medieval aspect of several churches of Rome (including this one) was restored. In Rome there were eight historical churches dedicated to S. Lorenzo (St. Lawrence) and each had some relics of the saint or objects associated with his life. According to the guide the following relics were kept in S. Lorenzo in Lucina: two cruets of blood, a pot of charred flesh, a section of the gridiron upon which the saint was roasted and the cloth used by the Angel to clean his body. Many visitors to Rome were (and are) bewildered by the number of churches dedicated to the same saint. S. Silvestro had just two churches dedicated to him, yet it was enough to confuse Francino. 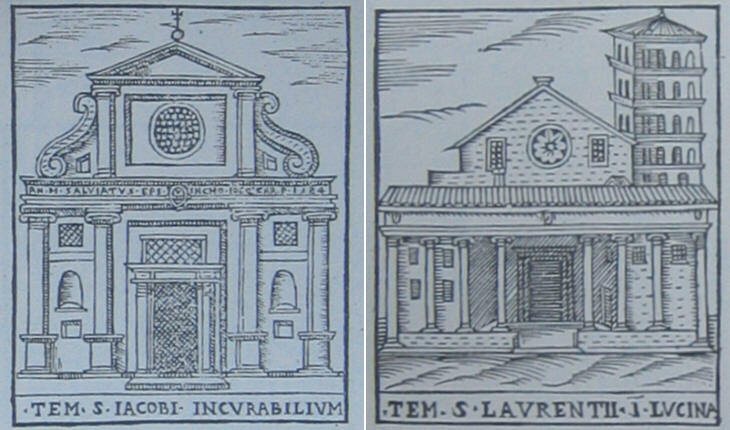 In the text he described S. Silvestro in Capite which is near Via del Corso and is important for its relics, but the illustration shows S. Silvestro al Quirinale, a minor church. Also the guides of the past occasionally led their readers astray. Pope Gregory XIII promoted astronomical studies which eventually led to a reform of the calendar; a by-product of this interest for the exact measurement of time was the construction during his pontificate of many clocks which were placed on public buildings and churches. 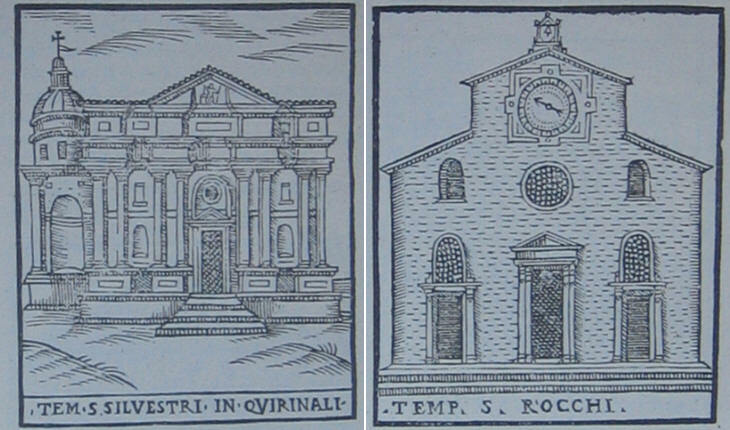 The clock he placed at S. Rocco was lost in the XIXth century when a new façade replaced that shown in the illustration. Francino's guide gives some details about the martyrdom of S. Marcello which later authors have preferred to omit. The site where the church was built was a stable of the Imperial Guard; the saint was confined there by Emperor Maxentius: the stench was so strong that Marcello could not breathe and died because of it. Another remark which was not reported in later guides relates to St. Lawrence; one of his jaws was among the relics which were kept in the church. In 1708 S. Marcello was given one of the finest Baroque façades of Rome. The illustration on the right shows SS. 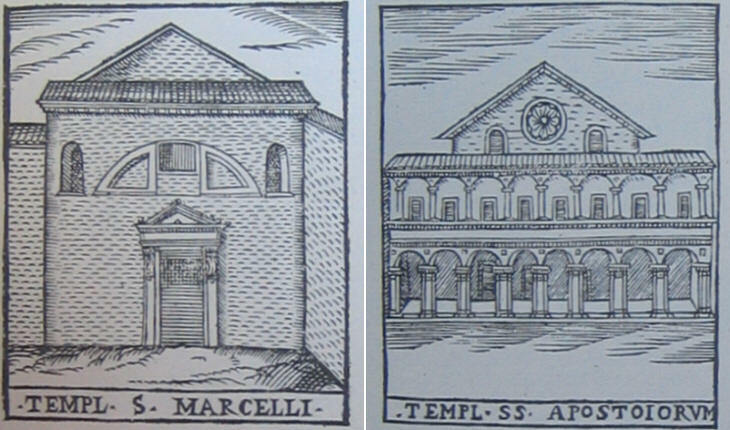 Apostoli prior to its Baroque and Neoclassic additions and without the bell tower. According to Francino, in addition to the bodies of three Apostles (Philip, James and John), its reliquary was a small anatomical exhibition: a rib of St. Lawrence, a knee of St. Andrew and an arm of St. Blaise. The devotion to the relics was criticized by Protestants. Gregory Martin (*), a contemporary English Catholic scholar, wrote in defence of this practice: It were infinite to go through al particularly. 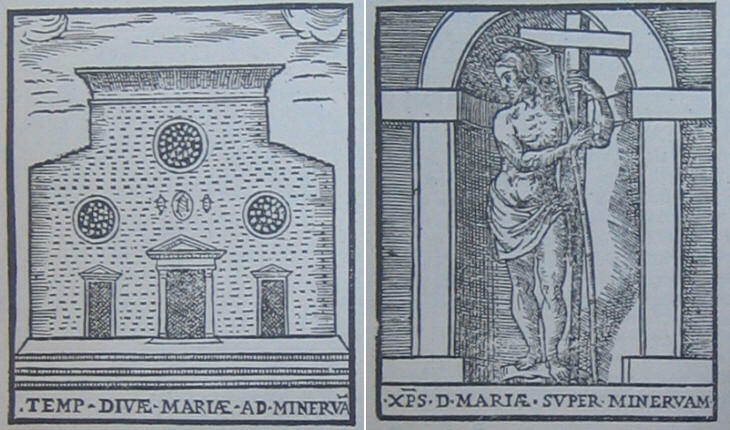 Let us onlie generally conceave the reverence and religious devotion in al such places at Rome, where either the bodies of Saintes lie in their tombes, or where they dwelt sometime, and prayed and practised al those vertues workes which made them Saintes, or where they were imprisoned, scourged, tormented, put to death, or where God hath shewed most wonderful miracles to his glorie and for an eternal monument of such and such places. Of these thinges Rome is ful. (..) All these places are now Churches, where a good Christian hart may at this day feele the warmth of Martyrs bloud shed for the love of our Lord and theirs." Yet Martin wrote a chapter in his book (Roma Sancta) about "Certen Scrupulous Doubtes Resolved" to describe the process introduced by the last Councel of Trent in these wordes: "Nulla admittenda esse nova miracula, vel novas reliquias recipiendas, nisi recognoscente, vel approbante Episcopo." That no newe miracles are to be admitted, nor new Relikes to be receaved, but the byshope examining or allowing them". 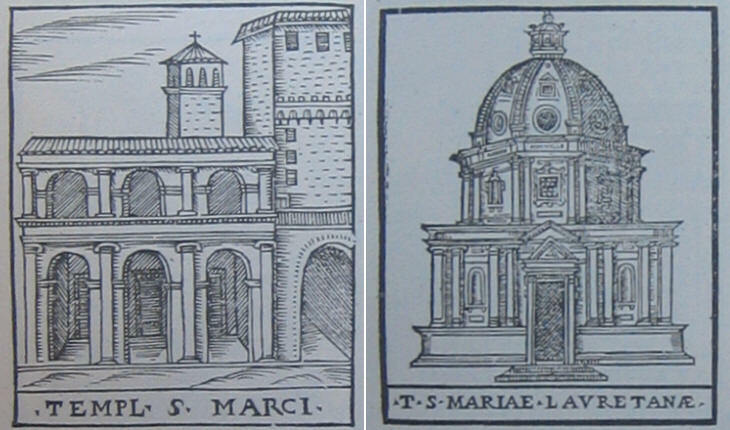 The illustration of S. Marco was most likely drawn without observation of the actual building, because the actual loggia has the same height as the portico. Also the (lost) arch shown in the illustration was not located next to the church but at a certain distance from it and it was perpendicular to the façade. The contrary can be said for the illustration of S. Maria di Loreto where all the architectural elements are accurately depicted; and for this church Francino made a rare aesthetic remark: fabbricata con bellissimo ordine (built with a beautiful design). In 1534 Ignatius of Loyola with six friends founded the Society of Jesus. Just fifty years later the Jesuits celebrated the consecration by Pope Gregory XIII of il Gesù, the most sumptuous church of Rome. The Order had become the most important one and the number of its members in Rome surpassed that of the great medieval orders (Franciscans, Dominicans and Benedictines). The guide dedicates two pages to the description of the church and of its works of art with many references to the marbles and metals (bronze, silver) which embellished its interior. Pope Gregory XIII entrusted Collegio Romano, a key educational institution, with the Jesuits. Its students attended Mass and other religious ceremonies in S. Maria Annunziata, a small church built in 1566 which was located next to Collegio Romano. While Pope Gregory XIII was a strong supporter of the Jesuits, his successor Pope Sixtus V, a former Franciscan, had a more cautious approach and also the following popes were wary of the power acquired by the Jesuits; they delayed Ignatius' process of canonization. He was beatified in 1609 by Pope Paul V. His successor Pope Gregory XV was educated at Collegio Romano and he sped up the canonization of Ignatius who was proclaimed saint on March 12, 1622. Immediately the Jesuits felt they needed to dedicate a church to the founder of their order. In 1626 S. Maria Annunziata was pulled down to make room for S. Ignazio, the largest church of Rome dedicated to a saint (with the exception of those dedicated to the Apostles). These be therfore so called bycause they are converted from their naughty life, and of common whoores and harlots made good Christian wemen. But how converted and what is the charity bestowed upon them? S. James saith, " He that shal convert a sinner shal save his soule from death, and hideth a multitude of sinnes." Two waies there are to worke their Conversion, thone by continual preaching unto them and persuading them by al scriptures and fathers and reasons to remember their soules health, and to repent and doe penance before they be taken away in their sinnes and abominations: the other is by honest and wise matrones of Rome, which either visite them sometime, or invite them to their company and vouchsafe them their familiarity, by that meanes to winne them, not fearing the stayne of their honour by the company of such, but contemning al pharisaical reproche, they matche them selves with the famous or rather infamous and notorious sinful wemen of the citie, such as sometime Marie Magdalen was, and so by their wordes and behaviour and promises and liberality toward them, they winne them to honest life and they plucke them out of the deepe pitte of dayly fornication, as it were raysing dead stinking carcasses out of their graves. Francino knew how to please his customers and he illustrated several churches which belonged to the countries they came from. 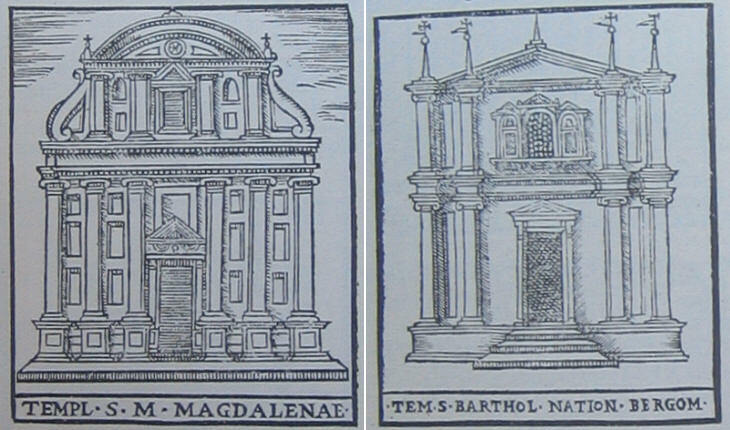 The illustration does not show the church which today is known as S. Bartolomeo dei Bergamaschi, but S. Macuto which at that time belonged to the brotherhood of the inhabitants of Bergamo in Rome. S. Maria sopra Minerva has a rectangular façade which is unusual in Rome. The illustration shows the church before the modifications made in the XVIIth century. At that time the church had a façade with a curved upper part (similar to that of S. Maria d'Aracoeli). Francino dedicated only one illustration of the guide to a statue; the choice of its author is very predictable: Michelangelo. The Florentine sculptor was unanimously regarded as the greatest artist of the Renaissance. The choice of the statue may be surprising: according to today's criteria Moses and Pietà would compete for the honour of being selected as the best work by Michelangelo in Rome. 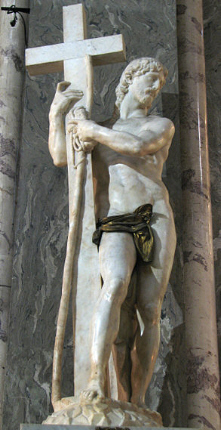 Christ Bearing the Cross in S. Maria sopra Minerva is no longer regarded as a masterpiece.